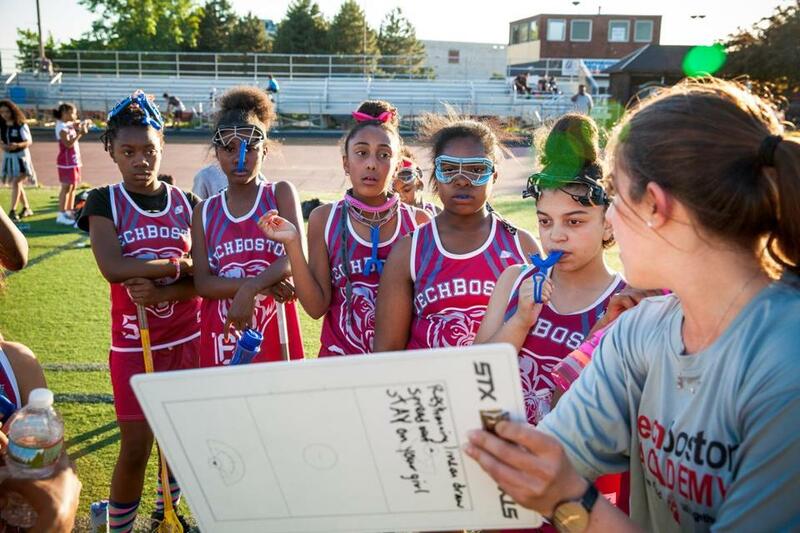 Eliza Halmo, girls&apos; program director for Harlem Lacrosse, goes over game strategy with her team from TechBoston Academy. When Simon Cataldo first began working for Teach for America in 2008 at the Frederick Douglass Academy in Harlem, N.Y., admittedly, he struggled to form a connection with his students. In what he described as an “act of pure desperation,” the Concord-Carlisle alum led the worst behaving boys from his special education class out to a concrete handball court. And in that after school session, he taught those boys the basics of lacrosse. A few months after Cataldo first introduced his students to lacrosse, they posted the best state exam math scores in school history by special education students. The Frederick Douglas administration approved Cataldo’s fledgling after-school program, which began incorporating mainstream students the following year. In 2011, the program was officially designated as a nonprofit. What started as a group of 11 kids playing with 10 lacrosse sticks on concrete courts is now a national organization comprised of 22 programs, operating across five cities, serving 828 students. The mission is to “empower the children who are most at risk for academic decline and dropout to reach their full potential,” with lacrosse serving as the foundation for improved athletic and academic performance. In order to achieve that goal, Harlem Lacrosse employs one program director, per gender, at each member school, offering round-the-clock support and guidance. The program first expanded to Baltimore in 2014 and opened a Boston chapter in 2016 with Dorchester’s TechBoston Academy serving as the first site. This year, it has expanded to the Young Achievers and Mildred Avenue middle schools, with the latter experiencing the highest participation rate of any member school in the country. Adrian Heneveld, the regional director for Boston, expects two more middle schools to join the fold this fall. Since its inception, Harlem Lacrosse has helped 100 percent of participating students graduate middle school on time. Students in the program pass their classes at a rate 20 percent higher than their peers and a total of 80 students have earned over $27 million in financial aid to attend preparatory schools or colleges. 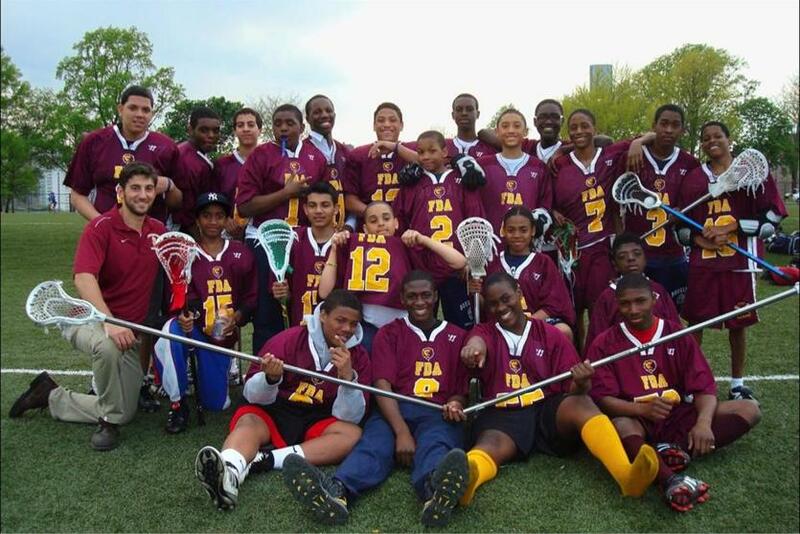 Simon Cataldo (far left), founder of Harlem Lacrosse, with his first Frederick Douglass Academy team in 2010. Corneilia Davis, an eighth grader at TechBoston, recently became the first member of the Boston chapter to receive full financial aid for prep school with help from the program. She will attend Cushing Academy in Ashburnham this fall. Davis is following in the footsteps of the first Harlem Lacrosse participants, Malcolm Akinje, now a sophomore at Tufts University. A 6-foot-2, 315-pound standout in both lacrosse and football, Akinje is a computer science major and doubles as a data analyst on the Tufts football team. The New York City native joined Harlem Lacrosse while attending Frederick Douglass Academy and often studied past midnight while applying to preparatory schools. With help from program directors, he received financial aid to attend Groton School, eventually becoming captain of the lacrosse team and a first-team Independent School League selection. “The biggest thing Harlem Lacrosse has instilled in me, is that life is hard, but the only thing you can control is where you wind up,” said Akinje. In many instances, the program has helped students utilize those tools. When Myles Smith applied to join Harlem Lacrosse as a seventh grader at FDA, Cataldo said his grades weren’t up to the standards outlined by the program or Smith’s mother. Smith was allowed to practice, but not play in games or mixed scrimmages. He stuck with it and became one of the top performers in the program the following year, earning a full scholarship to Cardigan Mountain School in Canaan, N.H, before enrolling at the Kent School in Connecticut. There, he became the first African-American lacrosse captain in program history. Now a junior on the Bates College lacrosse team, he frequently speaks at fundraising events for Harlem Lacrosse. Cataldo first took his students to Concord Academy for an overnight trip in 2011, and the tradition of helping inner city kids visit suburban and rural boarding schools has become an integral part of the program’s success. “We’re trying to help kids develop skills before they get to college to integrate themselves socially as well as academically,” said Cataldo. For the relatively new Boston chapter, lacrosse can serve as a way to change the academic culture through athletics. Avery Esdaile, athletic director for the Boston Public Schools, is optimistic about the future of Harlem Lacrosse. “It’s been great to see a program widening the participants’ perspective on what they can do athletically and academically,” said Esdaile. “Like we’re always trying to do with athletics, it plants the seeds of greater knowledge. 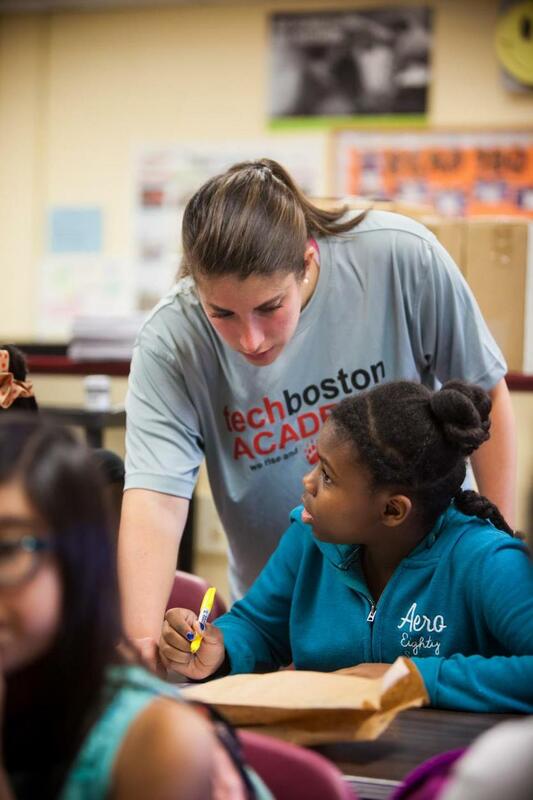 Eliza Halmo, girls' program director for Harlem Lacrosse, provides direction in the classroom for her student-athletes at TechBoston Academy.